Very happy about this, and working for better things. If personnel is policy, then biography matters, and work ethic matters, and character matters. Without going into too much detail at this point, I want to talk about the transformation that I’ve undergone in the last 18 months or so. What the photos don’t show is the sorrow and grief I experienced when my wife died in June 2015, and that I experienced for much of the year afterward. I started walking a lot to try to ease the pain – I have always walked a lot – but there was no easing the grief except through time, and even that has its ups and downs. I joined a gym in October that year. For a while I worked out in the evenings; after a few months, I switched to 5:00 am workouts. There are fewer people in the gym during those times, and it’s easier to stay on a regular schedule. More recently, I’ve been on a kind of “Younger Next Year” plan – working out or doing some form of walking and jogging six days per week. According to the authors, “six days a week” is the only way (and the best way) to maintain and even improve your quality of life as you enter into your 50’s and beyond. Three days a week now, I’m usually in the gym by 5:00 am, and out by 5:30 am. That was the case this morning. There’s not much competition for the squat rack at that time, although there still is some! I’ve settled on a program – “Stronglifts 5×5” – it involves squats, deadlifts, bench press, overhead press, and rows. On my off days, usually 2-3 other days of the week, I’m in the gym doing what they call “HIIT” cardio (“high intensity interval training”). I’m working toward the goal of losing my belly. Only recently have I found a diet regimen that makes sense and is working. So I’ve been going to the gym now for almost six months, on a fairly regular basis. I started in October, and now that it’s almost April, I’m still at it. I’m looking better and feeling better. The key to it is that I’ve been able to work it into my life as a routine. With writing, that’s a little bit harder. You have to sit and think and focus for a longer period of time than is comfortable. You have to do research. You actually have to know what you’re writing about. But the results are significant. I’ll put it into perspective for you – a kind of “Tale of Two Eloqua Partners”. When I was looking for a job in 2013, I had contacted a number of people – one of whom was Matt Heinz, founder of Heinz Marketing. He and I corresponded for a bit, and there seemed to be some interest there. One of his blog posts, from 2012, asked the question, “One thousand blog posts later, was it worth it?” Apparently the answer was a resounding “yes!”. This is my 1,000th blog post. For the first few years, I posted sporadically and when I had time. But for the past year, I’ve ramped up both publishing volume (posting something at least every business day) as well as how carefully we choose the topics I cover. This weekend I reflected a bit on whether it’s all been worth it. Many bloggers struggle with this question, and many marketers (including some of our clients) wonder the same thing. But for me, based on the criteria below, there’s no question it’s not only been worth the time and effort, but also been one of the most important marketing investments I’ve made and continue to make. The success here is quite the contrast to the results of the company that I actually joined. (I won’t mention names, but the company is listed in my LinkedIn profile). There, the focus was “sales”, as in “a good salesperson can do everything that’s needed to generate enough business”. We used a CRM, and as a salesperson, I was tasked with calling a lot of different people. And I made the calls – I was the leading salesperson one year, and over a period of time, I made far more phone calls than the other two sales reps combined. But the problem was, who was I calling? We were given a list of contacts, but they were stale, and there was no way of refreshing them. So I had to research my own list (in several different ways – I may go into this). And in the end, when we were setting up “call blitzes”, there were, after more than two years, still not more than several hundred contacts in my neck of the woods. In the end, I was dismissed for not being a good enough salesperson. Two different sales philosophies, two different sets of results. I think the results speak for themselves. These are the kinds of plans you ought to have in place before acquiring Eloqua – but what you have here is a great framework for thinking through your first tentative year as a Marketing Automation guru! How does 4Thought Marketing help you get started with an Eloqua SmartStart? 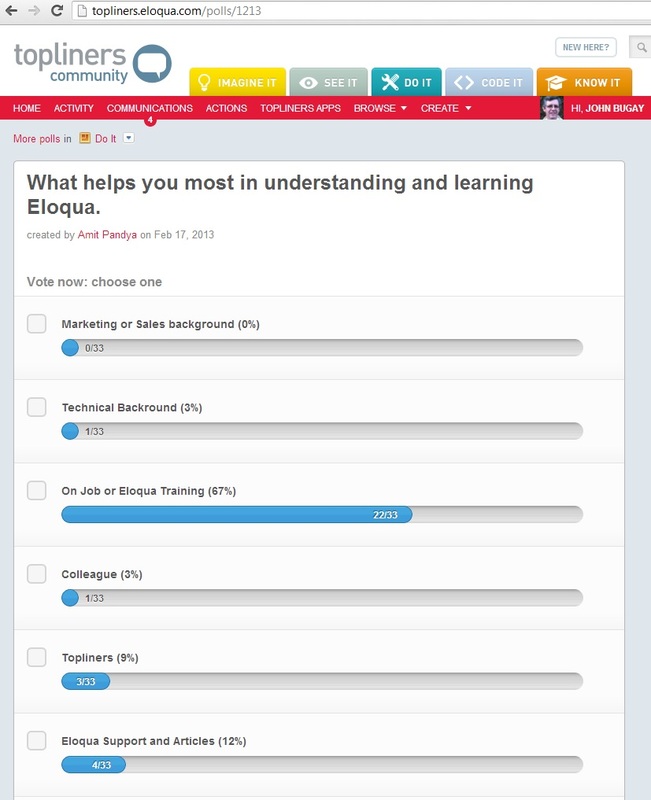 Amanda does a great job here of helping would-be Eloqua users to understand the process. The decision to work with a marketing automation program like Eloqua is no small decision. It’s going to involve a tremendous expansion of the skill-set that you possess. It’s going to tax your abilities, and half-measures (adopting it part-way) is not going to get you where you want to go. 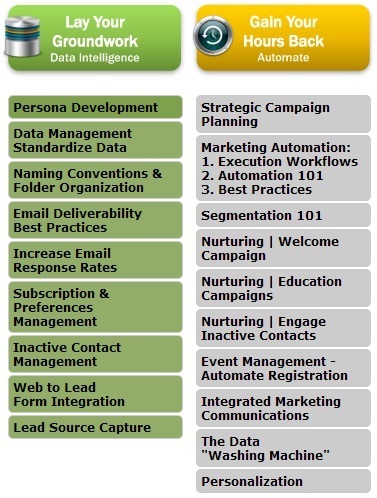 If you adopt Eloqua, your marketing department is going to need a re-think from top to bottom. As the Topliners poll shows nearby, the best way to become comfortable with Eloqua is to simply dive right in. (Click on the chart to see a larger version of it). While “diving in” may make some sense, you have to be careful about what you’re diving into. The process of learning Eloqua, from beginning to end, involves a great deal of effort (which is worth it). The instructions that Eloqua provided at http://growth.eloqua.com provide a realistic road-map of what that journey entails. Take a look at the list of just first-level of things you’ll need to do to “lay the groundwork” from that chart. I’ll go through these and provide just a few brief words on each of them. Persona Development: This involves fairly intensive discussions with the sales department to understand who the various people are who are buying your products and services, why they are buying them, and what the process is like to get from “interest” to “purchase”. Data Management/Standardize Data: Do you have data already? If so, there’s a likelihood that it’s not been “normalized”. If you don’t have data, you’ll need to think through and understand what you’ll need, and how to make sure it’s captured properly. Naming Conventions and Folder Organization: Eloqua’s folder structure is an important part of classifying your emails, and before you send your first email out, you should have some kind of roadmap to make certain your emails are organized correctly as you continue to build out your program. Email Deliverability and Best Practices: This is a whole separate science. It’s not as if there’s a dearth of material here; rather, the challenge will be to understand what targets you’d like to achieve, and then figure out how to be selective about which “best practices” you need to adopt. Increase Email Response Rates: In some ways, this is a subset of the previous item; in other ways, this is a function of testing to achieve the kinds of targets you have set for yourself. Subscription Preferences and Management: It’s an opt-in world; people hate getting spammed, and users will want to be able to opt themselves into and out of certain categories of information they will receive. Thinking through these categories is going to be vital to your efforts. Inactive Contact Management: Eloqua charges you solely based on the number of contacts you have in your database. That means, if you can reduce the number of contacts you have, you can reduce the amount of money you pay for your annual contract. But at what cost? Web to Lead Form Integration: Imagine the process that your potential customers will go through while in your “sales funnel”. You’ll want to learn more and more about them as they move forward. But what do you need to know, and when do you need to know it? Lead Source Capture: How will you capture the names of individuals in the first place? More and more marketers are popping up big “give-us-your-email-address-now” screens in front of the first visit to your website. Is that what you want to be known for? Don’t think you don’t need to do all of this. If you have a website – if you hope to use your website as a part of your selling process, then you either need to do all this, and more, or risk having your business become irrelevant to your users. Consider the broad range of disciplines that are involved in just this list alone. This is merely “laying your groundwork”, before you actually accomplish one thing. The amount of work that needs to go simply into laying your groundwork should be a sign to you that an Eloqua implantation is not going to be a one-time “set-it-and-forget-it” software installation. It’s going to be a way of life. In the beginning, a business starts with an idea. And if you’re a typical entrepreneur, you develop a love for what you do that drives you on. For example, maybe someone you know can’t unflutenate their wasteng. Everyone knows a flutenated wasteng is bad news. It causes pain for those afflicted by it, and so you work to develop a process that unfluenates wastengs to a stellar degree. Your process genuinely is the “quick and easy” way to unflutenate wastengs. In the midst of the time and energy that you put into developing this process, you develop a real love for it. And you can’t wait to tell the world what your new process will do for them. This is where content marketing comes in. For a time, your first customers are your first love. And they feel the love, to be sure. You can’t wait to be with them, and they can’t wait for you to come around. They subscribe to your materials, and refresh their inboxes constantly while they wait for news of your next offering. But then, over time, a business starts to take its customers for granted. Maybe the first generation of entrepreneurs, who loved the business, move on, or pass away, and another generation of leadership comes in and changes things; later, yet a third generation comes in and loses all memory of the first love that drove the business on. This would be bad news indeed. But it gets worse. The third generation of leadership, who has not only lost all love, but has lost all memory of the love, hires some high-powered sales and marketing executives to figure things out. These individuals may be proficient, but they don’t have the love for the customers that drives them on. They don’t have the love for your process. According to Jack Welch, former CEO of GE and now globe-trotting business guru, the most important thing you can have in business is “authenticity”. The most powerful thing you can do is, well, be real. As in not phony. As in grappling, sweating, laughing, and caring. As in authentic. That works in real life, but of course, when you talk about search engine optimization (SEO), it seems as if Google is looking for that sort of genuineness in its current search algorithms. To design something really well, you have to “get it” You have to really grok what it’s all about. It takes a passionate commitment to really thoroughly understand something, chew it up, not just quickly swallow it. Most people don’t take the time to do that. What does grok mean? According to Wikipedia, the science fiction writer Robert A. Heinlein originally coined the term grok in his 1961 novel Stranger in a Strange Land as a Martian word that could not be defined in Earthling terms. To return to our example above, you and your customers share the ailments associated with fluenated wastengs, and you work with all your might unflutenate them. You have more than empathy for such sufferers. You love them. The real joy is when customers love you back: advocacy is considered to be the Holy Grail of social media. Customer advocacy can really help you multiply the return on your efforts. It takes all of the above to a new audience and leads to word-of-mouth praise, online and offline.